First of all, The Raid 2 rolls with much more punches, second, it announces Evans as one of the world’s preeminent action filmmakers! 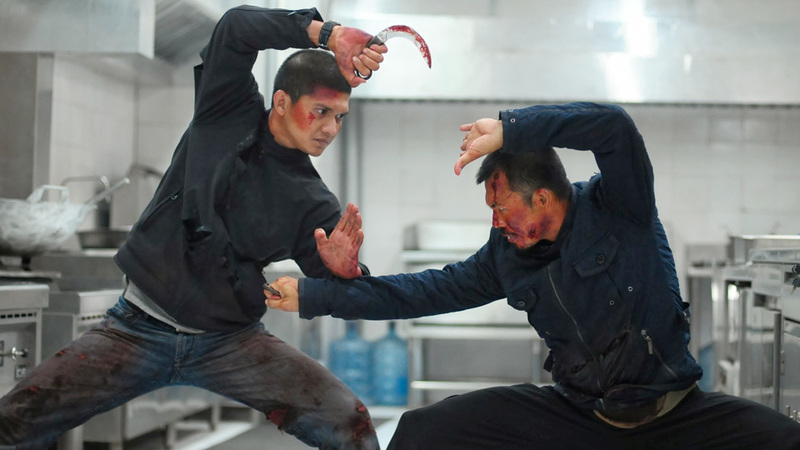 The Raid 2 lasts 2.5 hours and has little more than a nominal connection to its predecessor. This time Rama goes undercover in jail, where he befriends Ucok, the son of the mob boss Bangun. After his release, Rama, now called Yuda, starts working for Bangun, while striving to keep a rein on Ucok, a hothead keen to stir up trouble with the gang’s Japanese competition. If you read this story and expecting some kind of Hong Kong classic Infernal Affairs with a slow storytelling you will be surprised as The Raid 2 throws you straight into the martial-arts mayhem full of violence. The first martial arts film Raid was just one bloody, bone-breaking blur with only one hero to watch, the sequel has much more to offer, it is far more complex and has some interesting character development that was missing in the first. We have the amazing Hammer Girl played by Julie Estelle, a deaf woman who wields two hammers, smashing heads with a Tasmanian Devil–like speed. A brutal baseball bat-man with a phrase “Give me that ball” playing with his victims and crashing bones of every thug staying in his way. A son of one crime lord, Uco, played by Arifin Putra, distinguishes himself with sleek features and a jaded air, both of which genuinely suggest that he’d rather be fronting a Suede tribute band than doing mobster stuff. A mysterious character Eka, played by Oka Antara, the right hand of a Japanese boss Bangun, turns out an undercover cop. Prakoso played by Yayan Ruhian, who is making money by killing people with empty hands or machete, and giving them all to his ex-wife in a hope to see his son. And of cause an unbeatable Assassin played by a grand master of Silat Cecep Arif Rahman, this is he who will make Rama sweat to the death during a climatic fight. Gareth Evans is not Coppola or a Scorsese of cause, and he can’t (for now) quite juggle all these people and these subplots, but he is able to deliver non-stop bloody action scenes in a surreal dance of death package. The sequel gives Rama more to do than just fight, he broods about his constant state of jeopardy, misses his wife and child, rages against the machinations of both cops and criminals. Iko Uwais is a remarkable martial artist, furious speed and artistry contained within his each kick and punch. The film gets more brutal, roughly 90 per cent of film consists of violent fight scenes. And if The Raid was mostly one guy fighting a bunch of other guys, The Raid 2 is many guys fighting each other in various combinations. Evans now feels more comfortable and know exactly how to stage fights rhythmically, shoot them clearly, and capture their emotional energy, so sometimes camera just goes crazy. Sometimes you are asking for a break and wish for less brutality and more insight into the exotic gangster underworld, but a superb fight choreography doesn’t give you a chance to turn your eyes away from a bloody ballet of violence. Some of scenes are too sadistic, slaughtering a row of bound prisoners for example, and you catch yourself on a thought that human beings have no more importance than anything else… Too brutal. If in 2012 a young Welsh director was eager to make his name and did it successfully, in 2014 he created something amazing and ambitious, and raised the bar too high. With another instalment yet to come in the series, one can only imagine what Evans has cooking for audiences. The Raid 2 is not a film for everyone’s taste. But for martial arts fans, Evans has created a new chapter. If you are still asking yourself “How is he gonna top the first one?”, go and see it today… if you have the stomach for it. PS. I hope those guys and girls in Sydney and Melbourne with double passes will continue to follow my news and tweets and wouldn’t blame me in ruining their Wednesday evenings with so violent movie. Hope you enjoyed it, did you?